Drawing on our experience working with thousands of customers, we know that small organizations can save many staff and volunteer hours by having one integrated tool for a wide range of administration tasks. 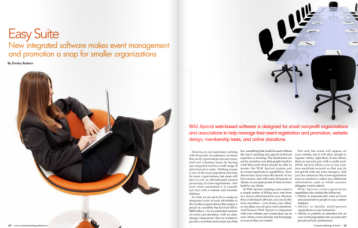 Holding events is one of the most important activities for many associations, nonprofits and other organizations - but many still have to rely on old-fashioned manual processing of event registrations and promoting events... what we set out to do is create an integrated suite of tools affordable to the smallest organizations. Also we wanted to provide a tool that can be used out of the box without any special technical expertise or training. Check out the complete article in the gorgeous 3-page layout put together by our friends at CM&E! And for more on Wild Apricot's event registration features, check here.